Treat dogs to crunchy and healthy biscuits for a premium taste they will love. Giving dog treats is more than an expression of love for dogs. It can be a critical component in dog training and rewarding good dog behaviour. Choose puppy and dog training treats that are healthy and tasty to reward your furry friend during dog training. Dog biscuits are a powerful motivator for dogs, as dogs love to work for a tasty treat. Our dog biscuits are extremely helpful during training sessions thanks to their pleasing texture and taste. Our Micro Bones Vanilla biscuits are small, but full of flavour. These bite-size treats are packed with wholesome ingredients that will keep your dog energized for any daily adventure ahead. These treats are suitable for all dogs, but especially great for puppies. Features vanilla for a delectable sweet and taste. Your pal will love them anytime he or she deserves a sweet reward. Our tasty biscuits are available in 900g and 1 kg buckets. Colourful Mix is a powerhouse biscuit. Get a mix of crunchy, scrumptious oven-baked biscuits for your dog. Features meat, cereals, vegetables and milk. For development, growth and maintaining health, minerals are essential in all phases of life. 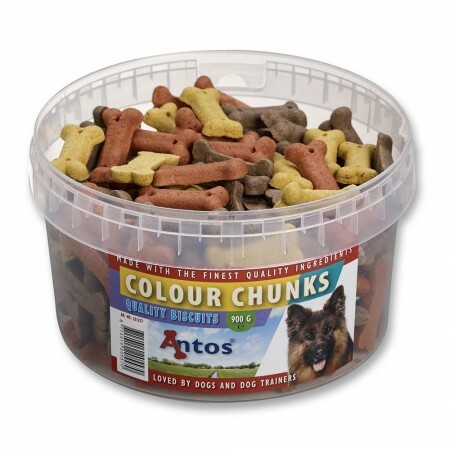 The Colourful Mix biscuits contains copper and zinc which are essential minerals and have many benefits for your four-legged friend.